While easy to handle and docile in the first few days of handling, iguanas can quickly become more aggressive. When stressed or aggravated, iguanas can lash out in many ways, so keeping a healthy and happy iguana is necessary. Iguanas can be difficult to manage because of their size. An average iguana can get up to 5' and even 6' long. Iguanas also require more responsibility since they are herbivores, meaning they only eat veggies, and you have to monitor what they eat much more carefully than other reptiles. They also can be more aggressive than most reptiles and require much more taming. How many iguanas can I keep in one enclosure? There isn't any one answer to this question, as every iguana is different. If you are planning to keep multiple enclosures, be prepared to separate them in the event the iguanas begin to act too aggressive to one another. What is an iguana's lifespan? With proper care and diet, an iguana can live as long as 20 years! How large will an iguana grow? As previously mentioned, iguanas can grow as large as 6', but 5' is much more common. Plan ahead with your tank size! How big should an iguana tank be? Iguanas can get very large, and at their largest need a 75-gallon tank. You can get a smaller tank and continue to upgrade the size as they grow, but you may be better off starting with a 75-gallon tank. An appropriate size branch should be included in every iguana's cage. A Repta-Bowl or Corner Bowl of appropriate size should be included in every iguana's cage. All bowls should regularly be disinfected. Use the chart on the side of the box to determine appropriate wattage. Iguanas by nature bask in the sun to thermoregulate (reach desired body temperature). A Basking Bulb will replicate the natural setting. 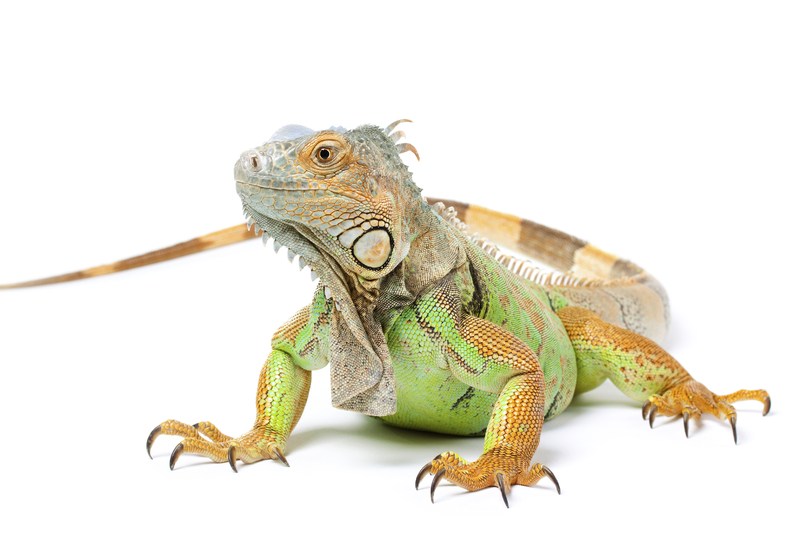 Keep your iguanas warm at night with minimal light so it does not disturb its night cycle. It is not healthy to leave daytime lights on at night. A 12-hour day and night cycle is needed for psychological benefits. Perfect for use in an iguana cage. This bulb imitates the natural light of the sun making it possible for the iguana to produce vitamin D naturally. The iguana needs vitamin D to aid in calcium digestion. Bone disorders are one of the common killers of captive iguanas. Includes extra outlets to allow the customer to plug in other accessories, i.e. Clamp Lamp, Under Tank Heater, etc. Combination Hood may be used for younger iguanas in a smaller tank when using lower wattage bulbs. The Heat Mat produces heat from the bottom of the terrarium. Its function is to help aid in the digestion of food. Hot Rocks may be used for older iguanas, but should not be used for juveniles because their skin is too sensitive for direct heat. Fluker's doesn't carry an iguana-specific diet, but our Tortoise Diet is suitable for your pet iguana. Comes in Large Pellet and Small Pellet. Fluker's recommends sprinkling Reptile Vitamin and Calcium:Phosphorus on animal's food once a week. (Not daily as some vitamins may be toxic if used in excess). This is a high protein supplement that promotes fast, healthy growth in iguanas.